An NTSB official studies the engine that failed on a Southwest Airlines jet during a flight from New York to Dallas, killing one passenger on Tuesday, April 17, 2018. (CNN) - Eight passengers who survived the Southwest Airlines flight that made an emergency landing after an engine failed in midair earlier this year filed a lawsuit against the airline Tuesday. The passengers cite injuries including hearing loss and post traumatic stress disorder, according to the lawsuit filed in New York Supreme Court in Manhattan on Tuesday. The lawsuit was filed in New York because the flight originated at La Guardia International Airport. A few passengers in the lawsuit cite marriages ruined due to the "devastating impact" of the incident on their relationships. "My clients went through a near-death trauma that will impact them for most likely the rest of their life," said attorney Jonathan Johnson, who is representing the passengers in the case. All eight of the passengers have a terrible fear of flying or say they'll never fly again, said Johnson. The passengers named as plaintiffs in the lawsuit are: Cindy Candy Arenas, Jaky Alyssa Arenas, Jiny Alexa Arenas, Joe Leos Arenas, Elhadji Cisse, Donald Kirkland, Beverly Kirkland, Connor Brown, and Cassandra Adams. GE Aviation Systems, The Boeing Company, Safran USA and CFM International are also named as co-defendants in the lawsuit. According to the lawsuit, the other companies with Southwest played roles in the design, development, manufacture and the sale of the engines used and the aircraft as a whole. CFM International, GE Aviation Systems, The Boeing Company and Southwest Airlines declined to comment on the pending litigation. CNN did not immediately hear back from Safran USA. Southwest gave all 144 passengers $5,000, a $1,000 credit toward Southwest airfare, as well as transportation to their final destination after the incident in Philadelphia, Southwest confirmed to CNN. Johnson said he doesn't have a problem with how Southwest handled the incident after the fact, "The problem is that the accident should have never occurred." He said expects more of the 144 passengers from the flight to also file lawsuits. Another passenger, Lilia Chavez, filed a lawsuit in April, days after the incident, also claiming personal injuries. The jet's engine failed April 17 about 20 minutes into the flight from New York to Dallas. Debris from the engine broke a window, causing a woman, Jennifer Riordan, to almost get sucked out of the plane. Riordan was pulled back into the plane but died at a hospital in Philadelphia. It was Southwest's first passenger death and the first death on a U.S. airline in more than nine years. Eight other passengers were injured, according to the National Transportation Safety Board. 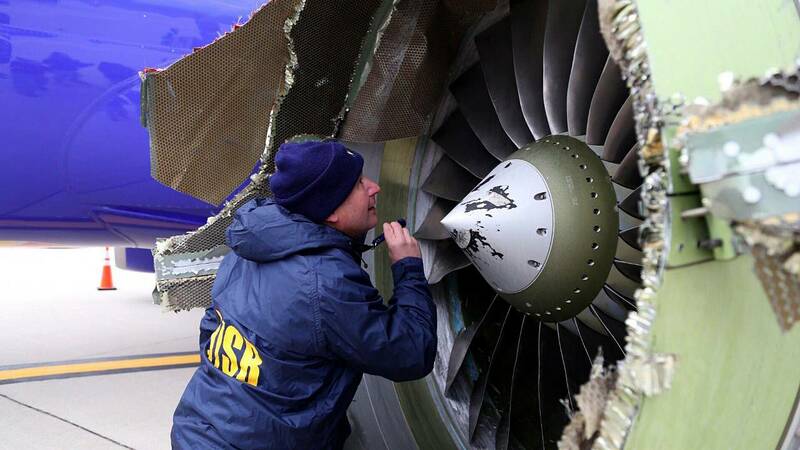 Investigators from the board later found that one of 24 fan blades was missing from the engine that failed, NTSB Chairman Robert Sumwalt said. The flight data recorder showed the plane was at 32,500 feet when the engine failed. Sumwalt said part of the inquiry will look at the CFM International 56 turbofan engine. Last year the FAA issued an airworthiness directive on the CFM56-7B version that would have required inspection of the fan blades. "There are various iterations of that (engine) and so I can't say exactly what that airworthiness directive might have applied to at this point, but that will be part of our investigation," he said. Later Sumwalt said the cowling for the engine was found about 70 miles from where the plane landed. The NTSB released a preliminary report in May. Johnson said he and his clients are awaiting the final report before they continue with the litigation.